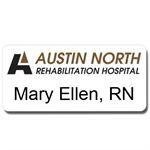 Surface Printed Vinyl Name Badge: 1 5/8" x 2 3/4"
Our most economical Vinyl Name Badges, these name tags are produced faster than the laminated version and your imprint is more vibrant. Prices range from $3.69 to .38 each. 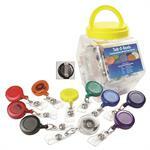 In-stock plastic, retractable Badge Reels have a retractable 30" cord. Prices range from $1.29 to .79 each. 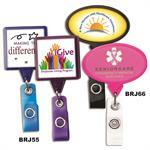 Custom imprinted name badge retractable reels are ideal for people who use their badge with a card reader. Prices range from $1.79 to $1.45 each. 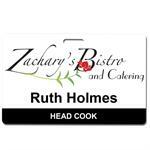 Surface Printed Vinyl Name Badge: 2" x 3"
Our most economical Vinyl Name Badges, these name tags are produced faster than the laminated version and your imprint is more vibrant. Prices range from $3.79 to .39 each. 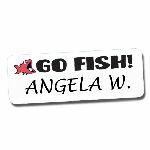 Surface Printed Vinyl Name Badge: 1 3/8" x 2 3/4"
Surface Printed Vinyl Name Badge: 2 1/8" x 3 3/8"
Our most economical Vinyl Name Badges, these name tags are produced faster than the laminated version and your imprint is more vibrant. Prices range from $3.89 to .43 each. 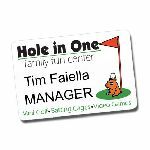 Surface Printed Vinyl Name Badge: 1" x 2 3/4"
Our most economical Vinyl Name Badges, these name tags are produced faster than the laminated version and your imprint is more vibrant. 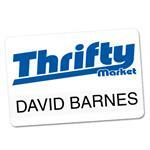 Prices range from $3.49 to $.37 each. 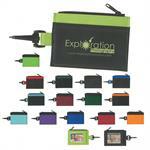 Our ID Holder has a clear card pocket on the back and your imprint on the front. Prices range from $1.85 to $1.42 each. Custom imprinted Jumbo Reels are made of recycled material with a polydome and a 360° Swivel Alligator Clip. Long 40”cord is tested to 150,000 retractions. Prices range from $1.99 to $1.77 each. These Antimicrobial Jumbo Badge Reels are made of anti-microbial plastic and have an extra durable reinforced white meshed vinyl strap. Prices range from $2.05 to $1.82 each. 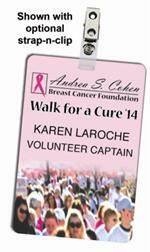 Event Badges: 4" x 6"
Event Badges: 3" x 5"
Full-Color Plastic Name Badge: 1" x 3"
These badges are printed in full-color on .030 white plastic. 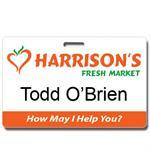 They can be personalized with label tape or marker. Order as few as 25! 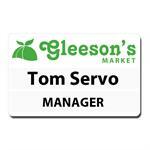 Prices range from $11.99 to .75 ea. 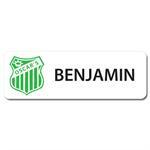 Full-Color Plastic Name Badge: 1 1/2" x 3"
These badges are printed in full-color on .030 white plastic. 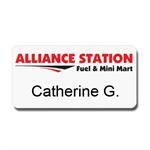 They can be personalized with label tape or marker. Order as few as 25! 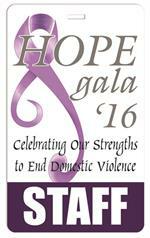 Prices range from $12.29 to .85 ea. 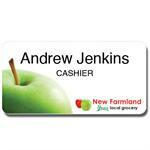 Full-Color Plastic Name Badge: 2" x 3"
These badges are printed in full-color on .030 white plastic. 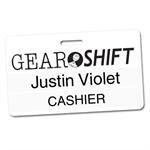 They can be personalized with label tape or marker. 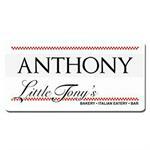 Order as few as 25! 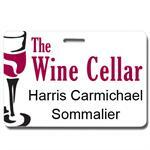 Prices range from $12.49 to .99 ea.